Munafa Network Marketing launched in 2017 and operated with one of the more bizarre MLM business models I’ve seen. For an investment of Rs. 25,000 PKR ($225 USD), Munafa Network Marketing affiliates were promised delivery of a motorbike within 45 days. After initially managing to distribute some 20,000 motorbikes, eventually the business collapsed. This prompted an investigation by three separate government agencies, eventually leading to the arrest Muhammad Ahmad Sayal, owner of the company. The promise of a $225 motorbike took off, with Munafa Network quickly establishing a network of thousands of affiliates across Multan, Faisalabad, Sheikhupura, Sargodha, Layyah, Sahiwal, Jhang, Thatha and Cheechawatni. The company took in billions of Pakistani rupees, with affiliates paid Rs. 1000 PKR ($9 USD) per new investor brought on board. I had a look into the company’s business model and it appears to be a pretty straight-forward 3×2 Ponzi cycler. You pay your fee, recruit others who do the same and when your matrix is full you get a motorbike. 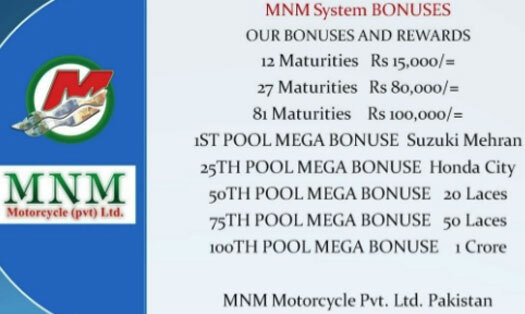 The Munafa Network Marketing compensation plan also mentions “maturity bonuses”, suggesting extra money was paid when recruited affiliates filled their matrices. 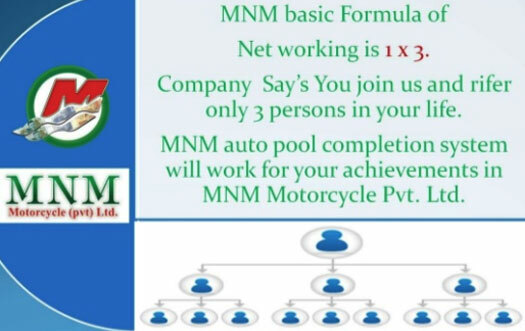 Through “mega pools”, Munafa Network Marketing affiliates were also able to receive Honda and Suzuki cars. An investigation into Munafa Network Marketing was initially launched by Securities and Exchange Commission of Pakistan (SECP). This was on account of Munafa Network Marketing being registered with the SEC as an importer/exporter of motorcycle parts. Under suspicion Munafa Network Marketing was a Ponzi scheme, the SECP referred the case to the Federal Investigation Agency. Further investigation revealed the “magnitude of embezzlement” was much larger than though, prompting the case to be transferred to National Accountability Bureau (Pakistan’s top anti-corruption agency). The NAB’s investigation lead to the arrest of Iqbal Zafar, who was believed to have stolen Rs. 17.8 million PKR through the scheme ($162,000 USD). Interrogation of Zafar lead the NAB to Muhammad Ahmad Sayal, who was identified as the Director of Munafa Network Marketing. On Friday 19th Munafa was presented in court on charges of embezzlement fraud. Authorities sought custody of Sayal so that they could further interrogate him. The request was granted, with the NAB to product Sayal in court again on January 29th. Update 10th May 2018 – Authorities have now arrested five suspects in connection with Munafa Network Marketing. National Accountability Bureau on Wednesday arrested another person in Munafa Network Marketing (MNM) motorcycle scam. The National Accountability Bureau arrested the accused, Sarwar Khan, at Sialkot airport as he returned from abroad. He was working as mega dealer of Jhang and Bhakkar districts. A court has given police until May 24th to interrogate Khan. The investigation continues. Update 30th September 2018 – A total of thirty-nine suspects have now been arrested. Authorities have pegged Munafa Network Marketing losses at $86.8 million. Article updated with news of fifth arrest.